While gold (followed by silver) has always been the most used metal for traditional jewellery, ornaments made of clay and lac bangles are also popularly used in Assam. In Barpeta and Goalpara, in Lower Assam, stones are set in the gold ornaments. Initially, gold was locally available, flowing down the Himalayan rivers, and the Sonowal Kacharis tribesmen were engaged in gold-washing along these rivers. A sonar could belong to any caste.. Jorhat in Upper Assam makes traditional Assamese jewellery, and people flock there to procure the exquisite Assamese jewellery. 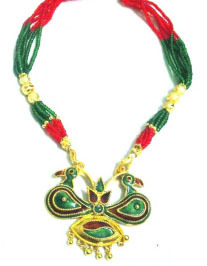 Assamese jewellery include the doog doogi, lokaparo, jethi poti, bana, thuriya, gaam kharu, gal pata, jon biri, dhol biri, and keru, all of which have also encouraged modern jewellers to begin producing similar designs mechanically. The jethi poti is a broad band of cloth on to which is placed a row of small medallions with a central pendant. The most interesting piece of Assamese jewellery is an ear ring that resembles an orchid known as kopo phool. It has the appearance of two small shoes hanging together and attached to a floral portion on top. This is connected to a chain that goes around the ear and is generally made in 24 carat gold. Lokaparo is another typical ear ring, which has two birds placed back to back in gold ruby and mina or enamel work. A broad bangle with a clasp called gaam kharu is made in silver with gold polish. Bana or jonberi is a crescent-shaped pendant filled with lac for a cushioned effect. The front is studded with rubies while the back always has enamelling.